As many of you probably know, the master drummer, composer and bandleader Paul Motian passed away on November 22, at the age of 80. Motian, who is my favorite drummer, possessed one of the most unique styles in jazz; so singular was his approach that his presence was always felt, even when performing as a sideman. Motian, who was performing and recording at a high level up until his death, has left an indelible mark on jazz: had his output been limited to his time with Bill Evans he would still be a major influence. 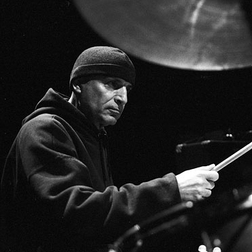 Considering his work with Evans, Keith Jarrett, his long standing trio with Bill Frisell and Joe Lovano, his huge body of compositions and the variety of recent projects with artists such Chris Potter, Jason Moran, Lenny Grenadier and others – one must conclude that Motian was one of the major forces in jazz for just under the last 50 years. Or putting that another way: jazz has been around in the national consciousness for 11 decades. Motian’s career spanned 6 decades. Beyond this blog post, there’s little I can do to honor Motian – I did not know him, nor did I meet him (although seeing his group at the Village Vanguard in ’06 was THE highlight of my jazz life). The best I can do to show my appreciation for the man and his music is offer my five favorite albums that feature Motian. In no particular order….. Conception Vessel – His first solo album, on ECM from 1972. I just picked up a pristine LP copy at a local antique store for $4. It’s perfect – a mix of solo percussion, duets and quartet. Includes Jarrett. I Have the Room Above Her – With Lovano and Frisell, on ECM from 2005. This record was my first exposure to Motian as a leader. I had heard the Evans trio discs, but I hadn’t heard anything like this album. I was very familiar with Lovano and Frisell at the time, but it was a Downbeat review that led me to buy the record. Perhaps one of my favorite recordings – in any genre. Bill Evans: Portrait in Jazz – Classic. If I remember right, the blurb from the original Downbeat review called this album “the truth.” If the only song on the record was “Witchcraft” – that would be enough. A perfect example of the innovations the group made to the piano trio format. Keith Jarrett: Death and the Flower – all of the American Quartet’s albums are good, and their four albums are just about the only Keith Jarrett I still listen to regularly (I love Fort Yawuh as well). The long title track, and the way it organically grows and evolves – completely natural and unforced. Paul Motian Trio 2000 + 1: On Broadway 4: Or the Paradox of Continuity – This is the group I saw at the Vanguard – featuring Potter, Grenadier, vocalist Rebecca Martin (Grenadier’s wife), and pianist Masabumi Kikuchi (if you think Jarrett moans at the piano a lot, then you haven’t heard Kikuchi, who makes Jarrett sound silent). Kikuchi and Martin split time as the “+1” member of the trio.